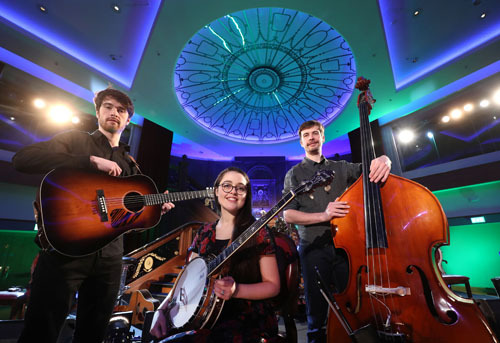 Titanic Belfast is the setting for a musical celebration of the genius of Robert Burns, whose work remains cherished in Scotland, Ulster and around the world, even 260 years after his birth in Burns By The Lagan. The programme is produced by Tern TV for BBC Northern Ireland with support from Northern Ireland Screen’s Ulster-Scots Broadcast Fund. Scottish musical legends Eddi Reader, Phil Cunningham and Aly Bain will be joined by local band Cup O’Joe, Andrew Calderwood and the Ulster- Scots Juvenile Pipe band presenting the songs of Scotland’s national bard against the backdrop of the world famous Titanic staircase. It will be broadcast on Friday (January 25) on BBC Two Northern Ireland, and also on BBC Radio Ulster, presented by Ralph McLean, at 9pm.